In Ethiopia, agriculture isn’t just a way of life: in many respects, it’s the cornerstone of life itself. Approximately 80-85 per cent of the country’s population is employed in agriculture. The country has the largest livestock population in all of Africa, and agriculture contributes more than 40 per cent of the country’s total GDP. But the country is both heavily populated and economically poor. There’s widespread food insecurity, limited social support for and acceptance of women, and 30 per cent of the country’s 85 million people live on less than $1.25 US a day. Improving Ethiopia’s economy and addressing the poverty of its people both depend a great deal on growth — in all meanings of the word. For more than 10 years, Dalhousie’s Faculty of Agriculture has had strong collaborative partnerships with Ethiopian agricultural institutions, working together to increase the country’s agricultural capacity. Now, a new international development project will take those partnerships to a whole other level. On Sunday, the Government of Canada’s Department of Foreign Affairs, Trade and Development announced a nearly six-year, $18-million project in Ethiopia. Titled “Agricultural Transformation through Stronger Vocational Education” (ATTSVE), the project will be led by Dalhousie with the support of partners the Mennonite Economic Development Associates of Canada (MEDA), Jimma University College of Agriculture and Veterinary Medicine (JUCAVM) in Ethiopia and McGill University. ATTSVE, one of the largest international development projects ever awarded to a Canadian university, will focus on enhancing current Ethiopian agricultural education programs available at agricultural colleges. Its goal is to help evolve the country’s agricultural practices and education beyond its subsistence-based foundation towards a market-focused system that better supports not only the economic strength of the country and its citizens, but also the unique needs of farmers, rural youth, the agri-industry and the broader rural communities. The official launch for ATTSVE was held Sunday at the MacRae Library on the Dalhousie Agricultural Campus, timed with the start of International Development Week. 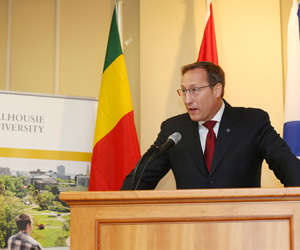 Minister Peter MacKay, MP Scott Armstrong, representatives from partner institutions as well as 14 deans and vice-deans from Ethiopia were in attendance. 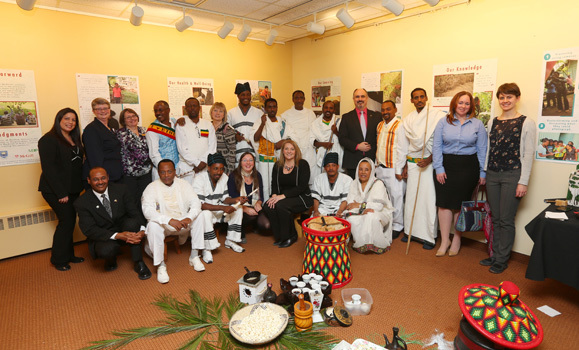 The event featured a traditional Ethiopian coffee ceremony, an important cultural component for ceremonial and social gatherings in Ethiopia. (Coffee is one of the country’s leading crops.) 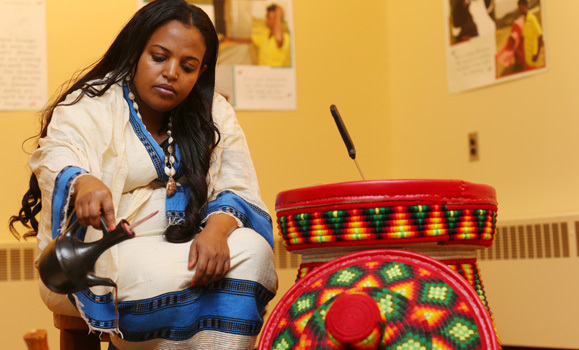 The ceremony is traditionally led by a woman and in this case, was led by Ethiopian doctoral student, Bizuayehu Mengiste, who has, under another project with Ethiopia, studied at the Faculty of Agriculture and Dalhousie’s Halifax campuses. Ethiopian doctoral student Bizuayehu Mengiste, who led the coffee ceremony. David Gray, dean of the Faculty of Agriculture, explained that the project will bring benefits on many levels: building capacity for agricultural training and education in Ethiopia with Dal’s partner colleges, bringing knowledge and experiences of Ethiopian agriculture to students at Dal, increasing potential research collaboration opportunities, and more. Peter MacKay, Solomon Demeke (Jimma University College of Agriculture and Veterinary Medicine, and Dal honorary degree recipient) and President Florizone chat during the coffee ceremony. 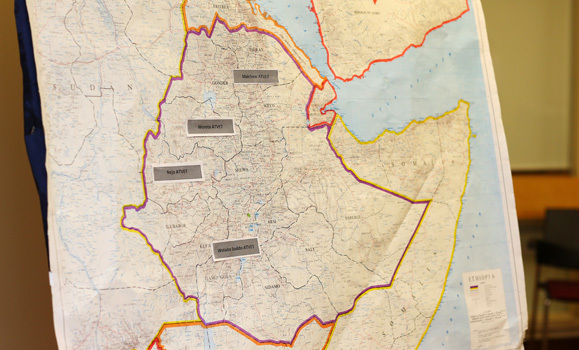 Currently, most agriculture technical and vocational training colleges in Ethiopia are located in rural areas and focus largely on competency-based approaches and outcomes. What they’re increasingly interested in, though, is programming that emphasizes rural growth through agriculture. They recognize that more emphasis is needed on marketing and entrepreneurship, as well as curriculum development and content delivery. The primary goal of ATTSVE is to increase the supply of male and female graduates from these institutions who have the necessary skills and knowledge not just to become successful farmers, but to develop the commercial agriculture sector in Ethiopia. The Faculty of Agriculture and other implementing partners will use their expertise in applied learning models to support Ethiopian instructors in delivering education programs aligned with the country’s national priorities. As the project lead, the Faculty of Agriculture will be involved in institutional planning and leadership, curriculum development/revision and project financial management. Jimma University College of Agriculture and Veterinary Medicine (JUCAVM) in Ethiopia will play a central role in applied research, increasing cooperative links with industry and information technology enhancement at the Ethiopian schools. The Mennonite Economic Development Associates of Canada (MEDA) will be primarily involved in business management training, entrepreneurship and value chain development. McGill University will be heavily involved in inclusivity and gender equality matters. The project will result in increased instructor training, more opportunities for institutional networking and partnerships and increased capacity at the colleges in a variety of areas, leading the graduates who will take part in entrepreneurship and market development initiatives. “ATTSVE will give youth the opportunity to train in a new way,” said Suzanne Johnson, ATTSVE project director at the Faculty of Agriculture. The location of the four colleges that the ATTSVE project will focus on. The Agricultural Transformation through Stronger Vocational Education project will focus on four colleges: Maichew (Tigray region) Nejo (Oromia), Woreta (Amhara region) and Wolaita Soddo (SNNPR). Not only will they share knowledge gained through the project with one another, but they’ll also help translate initiatives to other institutions in Ethiopia. “The ATTSVE project is very important and will enhance the capacity of agricultural technical and vocational education training institutions to be responsive and reactive to the emerging labour market,” says Professor Solomon Demeke of Jimma University College of Agriculture and Veterinary Medicine in Ethiopia. Dr. Demeke received an honorary Doctorate from Dalhousie University in 2014. Environmental sustainability, in terms of both best practices in natural resource management and institutional environmental plans, will continue to be part of the new project, along with gender equality. The latter, in particular, will be a key part of the Faculty of Agriculture’s work as it aims to increase the number of rural women farmers in Ethiopia.